Over the past year my consumption of pulses (chickpeas, lentils, legumes) has skyrocketed. And it’s not just because they’re cheap; they’re also packed full of healthy nutrients, can be stored for a long stretch of time in my kitchen cupboards, and are a kind protein alternative to meat (which I still eat, just less frequently). On my ongoing journey to “fall in love with fresh vegetables,” I’ve found inspiration in the flavours of the Levant; Israel, Jordan, Syria, and Lebanon. 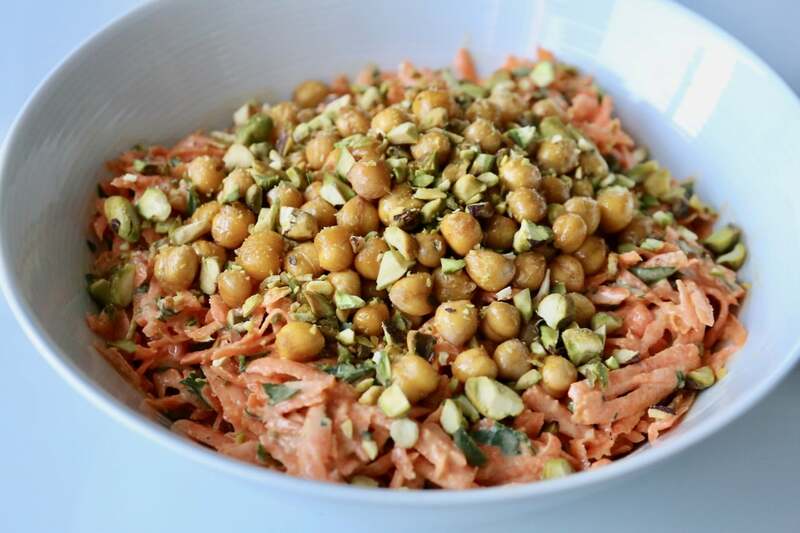 This flavourful salad offers crunchy carrots, tossed in creamy tahini, spritzed with lemon, muddled with fresh herbs and topped with crispy cumin toasted chickpeas and salty pistachios. Heat the oven to 425F. Toss chickpeas in 1 tablespoon of olive oil, salt and cumin until coated. Spread chickpeas on baking sheet or pan and roast in the oven until browned, 15-20 minutes. Toss occasionally to ensure they toast evenly. Whisk together garlic, lemon juice, tahini, water, 2 tablespoons olive oil and salt and pepper in a bowl. Place the carrots in a large bowl and toss with parsley. Add dressing and incorporate fully. Sprinkle with chickpeas and pistachios.